Do you ever find a recipe that makes you throw away all your preconceived ideas about what is difficult, what is worth your time, and what you like to cook? Do you ever think to yourself, gee, its 95 degrees out, but I REALLY want to make the pie in this month's gourmet magazine?? Do you ever do this when you've never actually baked a pie from scratch? No? Then, dear reader, you and I have little in common. I kid, but honestly, I have an absolute knack for biting off a little more than I can chew in the kitchen...then somehow pulling it all together. I usually have a meltdown in the process, but it all turns out fine. 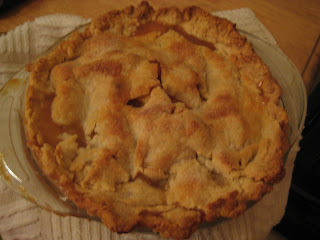 It all started at 9am when I woke, excited that today was the day that I was going to bake my first pie - this one. I was the first person awake in my boyfriends apartment (this was the only place I could bake the pie since his apartment has huge counter tops and a full oven/range). I started with the dough, since I knew it needed to rest in the fridge for a while. It was a basic pastry dough with lots and lots of butter (sorry David!). I got it all mixed, combined and wrapped in saran wrap while covering a good portion of bf's kitchen in flour. I cleaned up and started on the next piece of the recipe. I should have known that I was going to have an issue when I walked to the grocery store at 10am and broke into a sweat going 5 blocks for 3 pounds of peaches. But I decided to soldier on. After breakfast, and the dear bf setting up some music for me to bake to I was off. I first needed to blanch the peaches...boiling water and ice bath set up. I dunked peach after peach and counted to 30 (15 seconds more than the recipe instructed). Then I peeled the peaches. This whole part of the recipe took me about an hour (I cannot lie, this part was excruciating). The funniest part was that the bf had set up some Eric Clapton for me to listen to, and in the midst of my peeling debacle, a song "EASY AS PIE" came on the IPOD. I started cursing that this was some cruel joke. **I honestly think the peaches weren't quite ripe enough, which is why it took so long to peel. Next time I will either blanch them a little longer, or try to start with riper fruit. 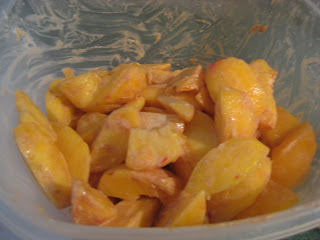 Once the peaches were all peeled and sliced into wedges, I added the cinnamon, cornstarch, sugar, etc....I then got to work on the honey-caramel. 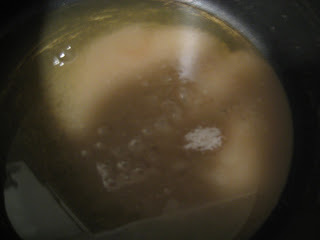 Sugar and caramel into a pot, brought to a bubble, then taken off heat and butter added. This was SO fun. 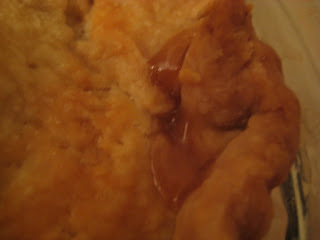 I hadn't made caramel with honey before, and the flavor was just delicious. This was added to the bowl of peaches. 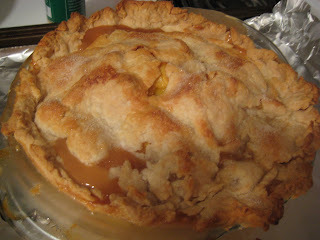 After the peeling of peaches, the most difficult thing about pie making was the crust. I was in an apartment inhabited by 20-something males. In all honesty, the cupboards aren't as barren as one might think for 3 guys living together. My bf is a decent cook, and his roommates' gf (AK) is very comfortable in the kitchen (and shares my love of Ina Garten and the Food Network) so between the 3 of us the place is stocked with most spices and ingredients. Although they have most ingredients, they don't have all the tools that can help things along...and what they do have (roasting pan, crock pot) is actually mine that I've left there. In short, they did not have a rolling pin for the dough - so I rolled it out with an unopened bottle of Charles Shaw. I floured the wine bottle and the countertop. My pie pan was one inch larger than the recipe called for, so I think I just didn't have enough dough. It kind of fell apart into a couple pieces as I lifted it into the pan...but I seamed it together. Same for the top piece. I was a little disappointed as it went into the oven. It looked terrible. I was sad, but the bf assured me that the best pies don't look perfect, they look homemade. I didn't believe him, so I choked back my disappointment and settled in to watch some TV. OK, so it came out of the oven and it still wasn't the most beautiful pie ever...but let me tell you, it was DELICIOUS. I split one slice with the bf the first night - then declared that it was too delicious to keep in the house. We went to visit my best friend the next day and brought 1/4 of the pie along with us. first off, congratulations on 1000 visitors! Second, I would like to know why more of this pie isn't floating around. it looks great, sounds great! and took you way more effort that I would have put in. I would have left the skins and just sliced it up, cooked them for a moment or two...I am so impressed!!! I did go out and buy a rolling pin! And you and I are most definitely a lot alike. Those darn Gourmet, Food & Wine, Bon Appetit,etc., pictures! If I see something I want to make, I make it no matter the conditions. P.S. I love that you used a bottle of Charles Shaw to roll it out! Congrats on you 1000 visitors! I used to think making tiramisu was completed... until I realized it is really easy to make. Your peach pie looks amazing! Peach pie is my favorite ever. Yum.